Begin by making a cone shape from construction paper. Use a pen to mark inside the cone where you will tape it together. Open it up and use colorful markers to draw Indian symbols such as turtles, bear claws, suns and mountain ranges. There are plenty of symbols on the internet, simply do a web search for “american indian symbols”, then choose the images option to see the different sources. After decorating your cones, tape them together, inside and out. Use scissors to snip off a small slanted opening at the top. Cut pipe cleaner into 6 equal parts. Twist three of those pieces together at one end. Hot glue the twisted end into the opening at the top of the teepee. Repeat with the remaining three pipe cleaner pieces for the second teepee. 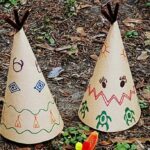 This project for Construction Paper Teepees was printed from CraftsbyAmanda.com - https://craftsbyamanda.com/construction-paper-teepees/ and can only be printed for education or personal use.